DKNVS and NTNU invite nominations from scientific academies, research institutions and universities to ensure a balanced invitation of natural, social, technological and human sciences. Nominations will only be eligible when submitted by full professors with permanent positions at recognized universities or senior researchers at research institutes. Self-nominations are not accepted. Nominations are now closed. The winner is Sandra M. Díaz. The prize will be awarded at the NTNU Science Festival in Trondheim on June 17th 2019. The award honors outstanding scientific work promoting global sustainable development. The aim is to contribute to the strengthening of research and advancing the achievement of the scientific evidence base within the interdisciplinary Sustainability Science. The field of sustainability science advances our scientific understanding of the dynamics of human-environmental systems. Sustainability science is therefore a synthesis, integration and awareness of different scientific disciplines that recognizes the interaction between natural and human systems, and can aid in the transition to sustainable systems. The Gunnerus Award in Sustainability Science will be presented to a scholar who has made outstanding contribution to sustainability science within the fields of the natural sciences, social sciences, humanities, or technological sciences, either through interdisciplinary work or through work within one of these fields. Candidates who have shown that their scientific results have been translated into active policy and applied into expedient management systems, will be prioritized. The candidate must be of exceptional scientific quality assessed by published work and scientific impact. The candidate’s accomplishment should contribute to a richness of social benefit to humanity within the framework of sustainability, and contribute to changing perceptions or methodologies within the field of sustainability science. The 2019 Gunnerus Award in Sustainability Science will be given to one scientist, or in the case of closely related fundamental scientific contributions, may be shared between two scientists. The international Gunnerus Sustainability Science Award is a collaboration between the Royal Norwegian Society of Sciences and Letters – Norway’s oldest scientific institution and the original founder of the prize, and the Norwegian University of Science and Technology – Norway’s largest university, represented by NTNUs strategic research area – sustainability (NTNU Sustainability). The prize is awarded every two years. 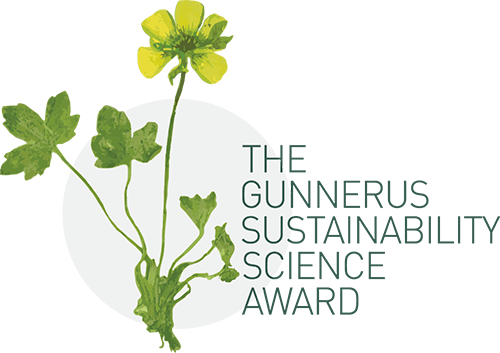 The Gunnerus Award symbol is based on a meadow buttercup from 1767 in Johan Ernst Gunnerus’ herbarium. A Scientific Committee of five members from the Nordic countries is established to evaluate the nominations. The chair is Norwegian. The Scientific Committee itself may nominate candidates for the prize. The Committee ranks the premier three candidates. The board of DKNVS and an expert group on sustainability from NTNU, appointed by the Rector, thereafter select the award winner in a joint meeting.